The declaration orders federal assistance to help state and local response efforts. The blazes have raged for days. 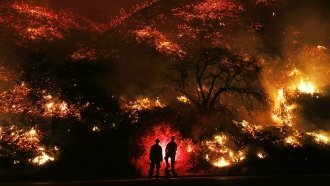 President Donald Trump approved an emergency declaration for California on Friday as wildfires continue to scorch the southern part of the state. The declaration orders federal assistance for state and local response efforts. The blazes have been raging for days. The president's response came just one day after California Gov. Jerry Brown asked Trump to declare an emergency in the state. The Ventura County Fire Department says the Thomas Fire burned 132,000 acres by Friday morning. Hundreds of structures have been damaged or destroyed. And roughly 200,000 people were forced to leave their homes. Officials say "critical fire weather" is expected to continue for the next few days.